The City of Ponderay is the proud gateway to Schweitzer Mountain, a year-round destination resort that boasts 2,900 acres of skiable terrain, 92 trails, open-bowl skiing, three high-speed chairlifts (including Stella, Idaho’s only six-person high-speed lift), plus cross-country skiing trails, a tubing park and snowmobiling access. In the summer, Schweitzer becomes an outdoor-lover’s paradise with more than 40 kilometers of hiking and biking trails to enjoy. 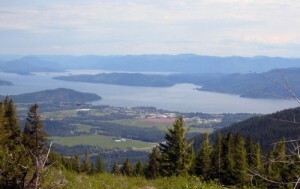 Take a ride on the Great Escape Quad chairlift for sweeping views of Lake Pend Oreille and beyond. And don’t forget to check out an array of summer festivals featuring live music and fun activities. In town, visitors will enjoy the 9-hole Elks Golf Course on Highway 200 in Ponderay, a par-35 course featuring 2,897 yards of golf from the longest tees. Shoppers, don’t miss a stop at the Bonner Mall, located at 300 Bonner Mall Way, where a variety of local and national retailers are housed in a comfortable, climate-controlled setting. And catch the latest Hollywood flick at the six-screen Bonner Mall Cinemas, located at the east end of the mall.